Matthew Ruane kickstarted James Horan’s return as Mayo manager when his 68th minute goal helped his team to beat Kerry in Tralee last night. The big midfielder has been one of the stars of Mayo’s League progress this season and he cracked home a cool finish to seal the deal for Mayo. It means Mayo now only need a draw against Monaghan in Castlebar next Sunday to reach the League Final - where their opponents will almost certainly be the team they faced last night. As with every game yesterday, this was always going to be the cliched game of two halves with a gusting wind blowing straight down the Austin Stack Park pitch. Kerry won the toss and decided to play with the elements at their backs in the first half as they chased a sixth win in the League. The afternoon results meant Mayo were at least safe from relegation, but maybe the wind wouldn’t be the only problem for both teams, perhaps they would be passing to the wrong players. Given the similarity of the counties’ first colours, Mayo were playing in blue and Kerry in beige. Yes, beige, a few old Kerry footballers must have swallowed hard looking at that. They probably swallowed hard at Kerry’s start too with Mayo setting about them with abandon, scoring the first three points. The middle score, on the end of a superb solo run from Matthew Ruane, was a wonderful point. The Kingdom were curiously inept in the first half, making basic handling and passing errors that were not part of their early seaosn rampage through the competition. So far in the League, Kenmare’s Sean O’Shea has been a shining star for Kerry and he was to the fore again last night, kicking a couple of beautiful points to haul his team back into the game. At the other end of the experience scale, Tommy Walsh was making excellent marks for Kerry, leading to two points for the home side. You can understand Kerry using the attacking mark tactic last night in the conditions. But that game won’t be open to them in the summer. Their defence did tighten up and began to snare the Mayo attackers in a defensive web, ensuring the first half ended with Kerry three points to the good. Yet they must have wondered would that be sufficient with a hard 35 minutes of football to come into the wind. And Mayo almost made a second perfect start to a half, but Kerry goalkeeper Brian Kelly made a fine save to foil Ruane after Donal Vaughan, who had an excellent match, had played him in on goal. However Mayo’s old failing, a lack of attacking power, was again evident. They had chances for points, but Kerry suckered them into going for pot-shots, instead of playing the percentages. Still Mayo stuck at it and two booming Jason Doherty frees put them level and then ahead with 15 minutes left. It was the first time, bar those last few minutes against the Dubs, that this new-look Kerry side had been under the cosh. They came through that night, now could they repeat the trick? Peter Keane summoned former Footballer of the Year, James O’Donoughue, for his first appearance of 2019. Mind you, corner-forward wasn’t where Kerry were having their problems. 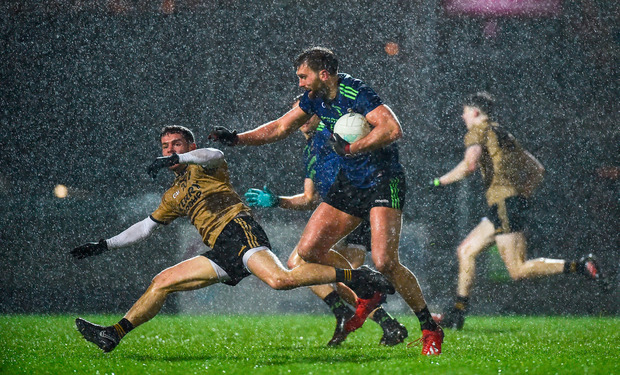 They couldn’t work the ball up the pitch in the conditions with a tough-tackling Mayo defence waiting on them. Sean O’Shea hauled Kerry back level with a brilliant ‘45’ into the wind, before Mayo edged clear again as the crowd of 10, 218 warmed to the entertainment on a filthy night. It seemed we were set for a grandstand finish until Ruane intervened off a lovely pass from Kevin McLaughlin. Kerry fought valiantly to reel in their visitors, but it wasn’t to be. This, in the Tralee rain and wind, was Mayo’s night.